Somehow I always find a way to make things more difficult…usually without even trying. Last Saturday, I attended the 2013 Bandfest and Trinidad & Tobago v. Belize soccer match on what I will now melodramatically refer to as “the hottest day of my life”. The next day, I later found out, was even hotter. Apparently the temperature in Belmopan last Sunday was over 100…a level I’ve never seen on Ambergris Caye (seen is the correct word…the air was visibly radiating with heat). So what do I decide to do? 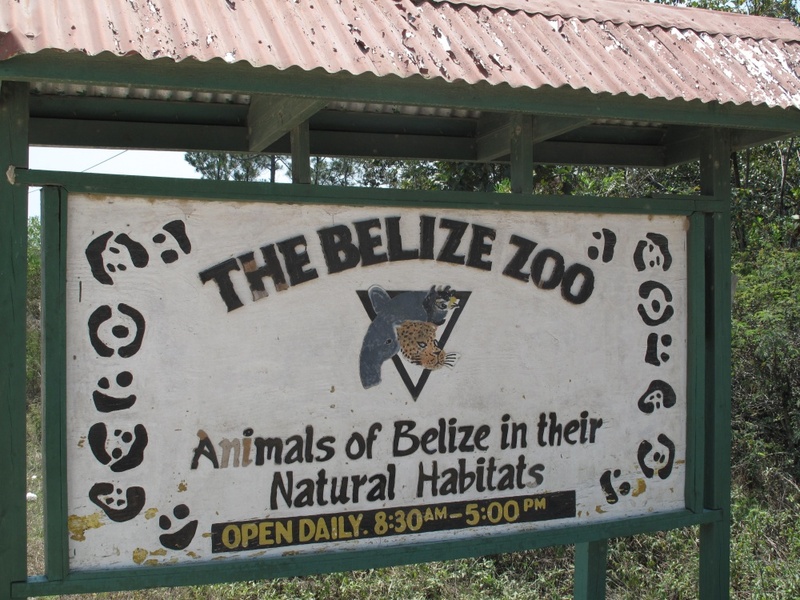 Take the Sunday local bus to the Belize Zoo. 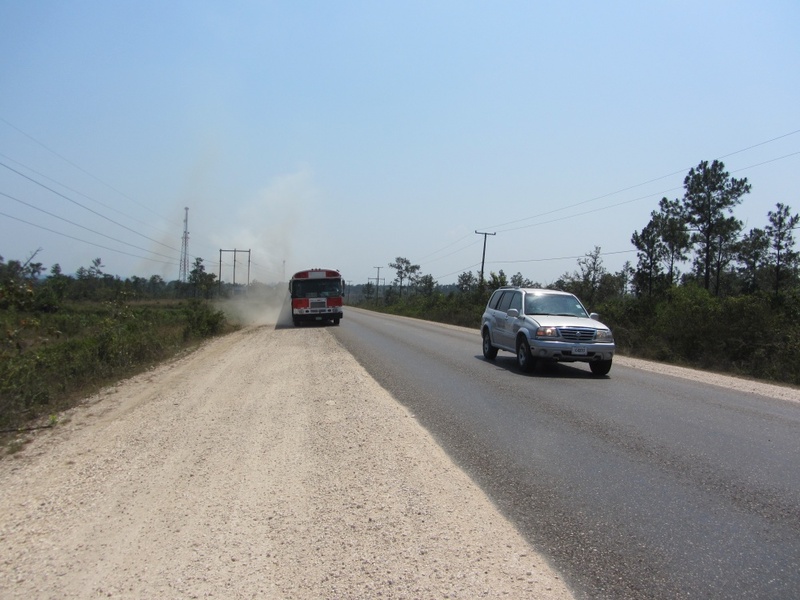 The local bus that stops in each village, that has no air conditioning, is jam packed and since it is Sunday, comes sporadically, leaving you waiting on the side of the road for up to an hour in the blazing heat. 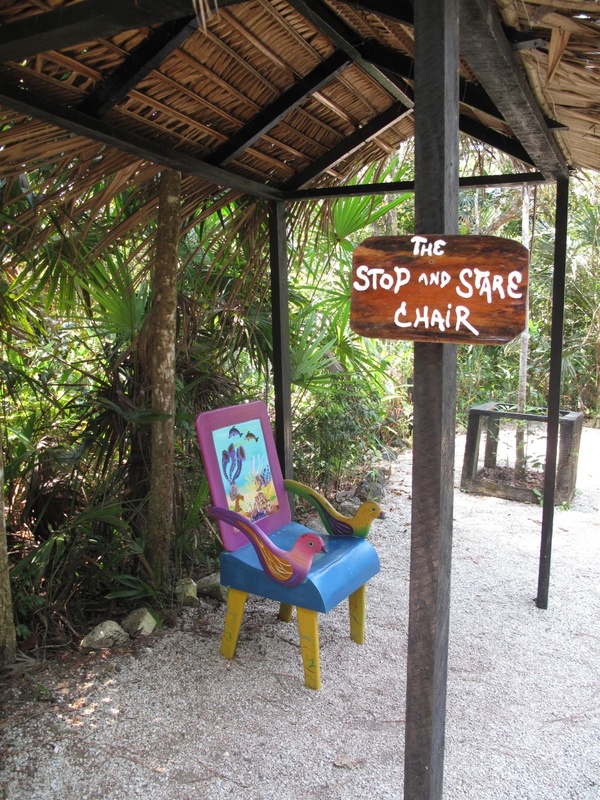 Here are just a few of the stops. Don’t worry…they’ll stop as much as they need to. Genius. Pure scooping genius. 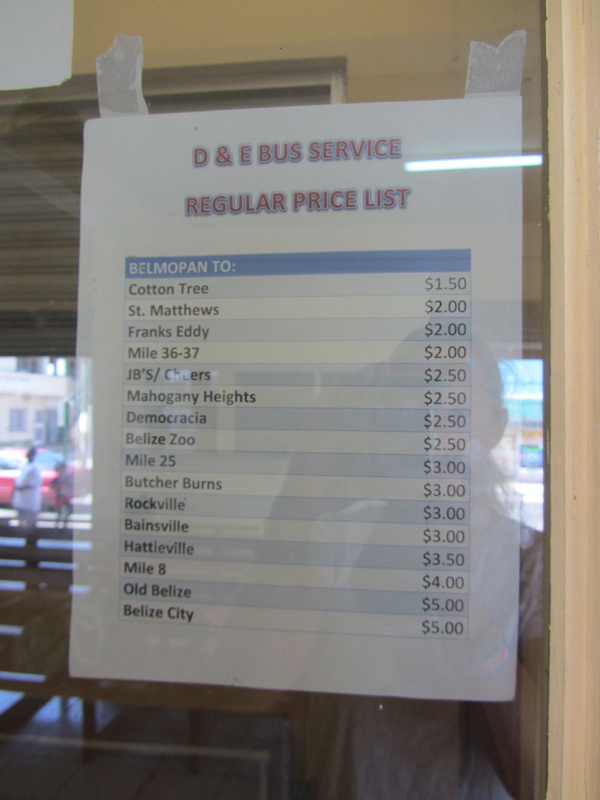 But seeing that I am never one to complain, I took a seat in the Belmopan bus station to wait for my $2.50bzd chariot. Apparently everyone was waiting for the bus, because as soon as it arrived, everyone jumped up and crammed in to claim the 4 or 5 seats available. People mean business and elderly ladies have no problem cutting the line and throwing elbows…mothers no problems leading with a new born baby to get those precious seats. “No standing on the bus” was announced and we all retreated. Hot and super crabby…I needed to find an alternative to get those 23 miles to the Zoo and budget travel was no longer on my mind. I headed outside, found a taxi driver and bargained him down from $60bzd to $40bzd. To the zoo! 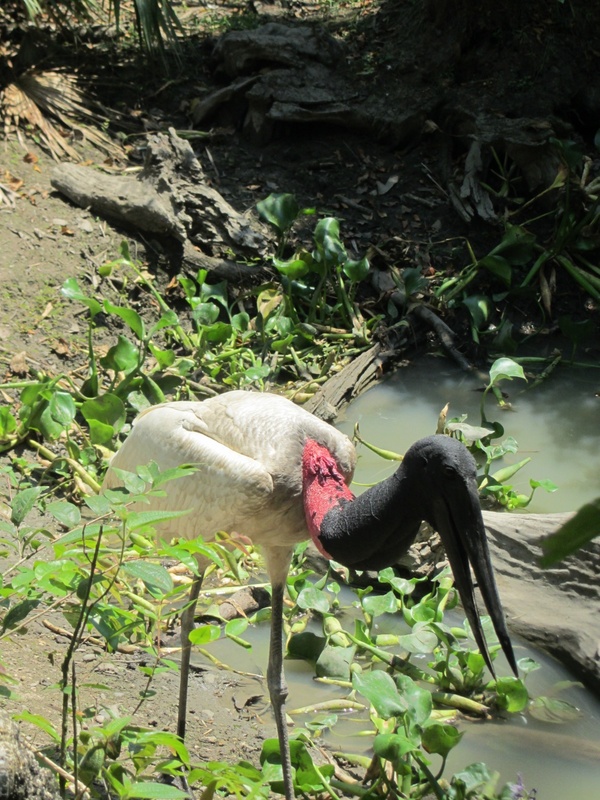 I’ve been to the zoo a few times and love it. There is no other zoo I’ve visited where you can get so close to really amazing animals. And the signs at the park are so cute. 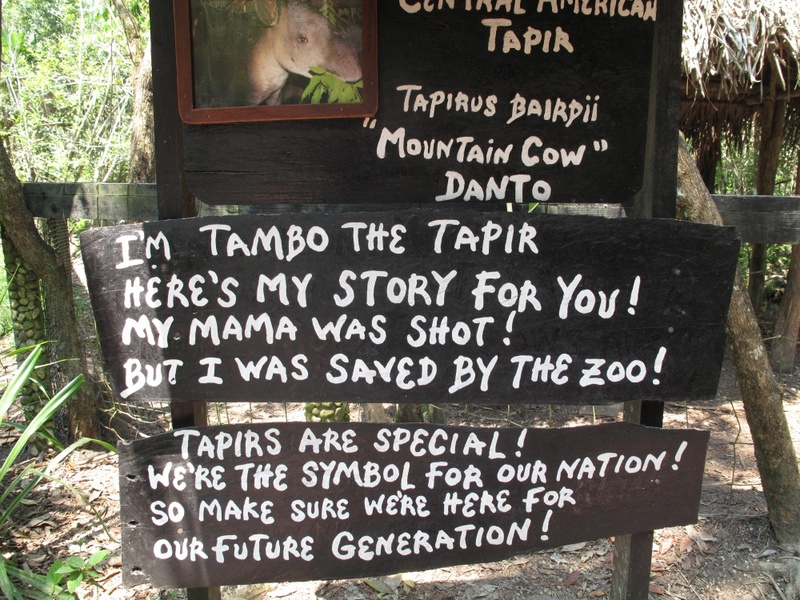 Here’s the national animal of Belize, the tapir. 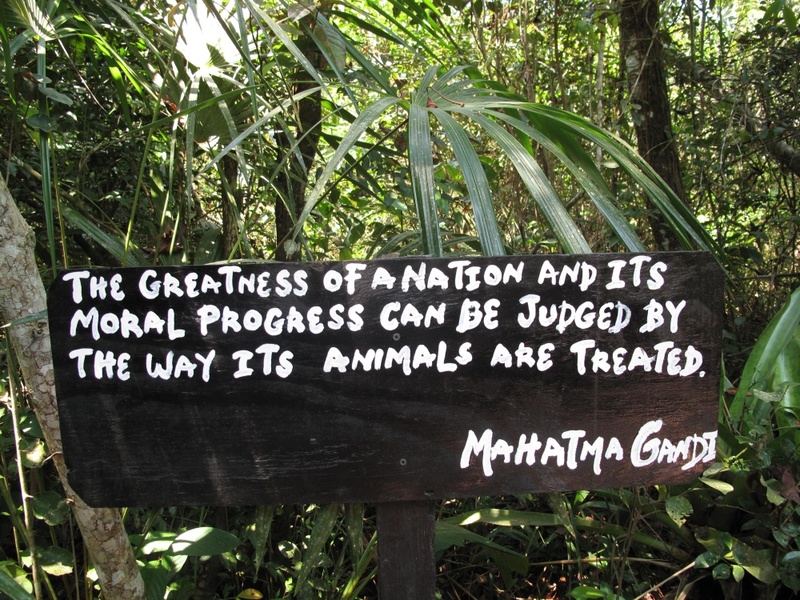 From an earlier trip to the zoo, I learned a valuable lesson the hard way. If he is turning his rump in your direction, run. They have been known to spray. 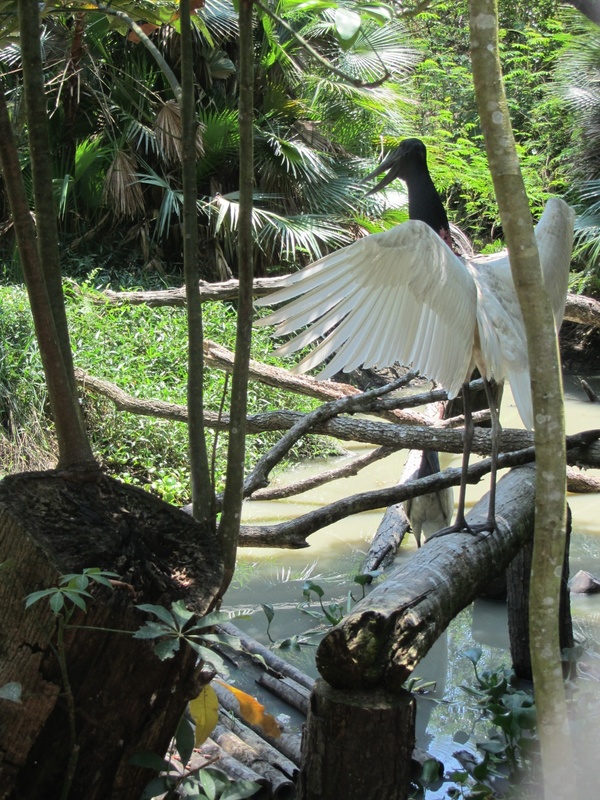 Here is the huge jabiru stork. Adults stand over 4 feet tall. There is just something about that beak that makes me fear for my eyeballs. 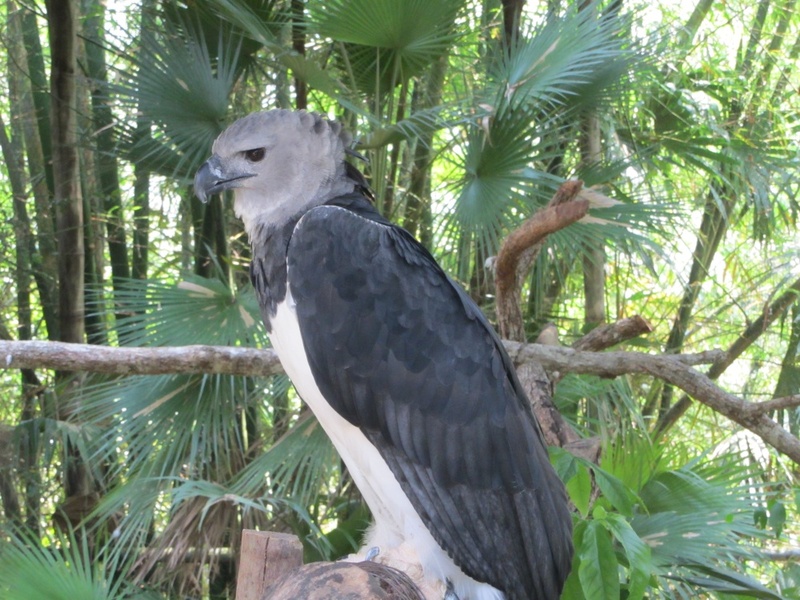 And the gorgeous harpy eagles – the largest and most powerful raptor in the Americas. Its talons are longer than a grizzly bear’s claws. He’s been known to pick off monkeys and small pigs. 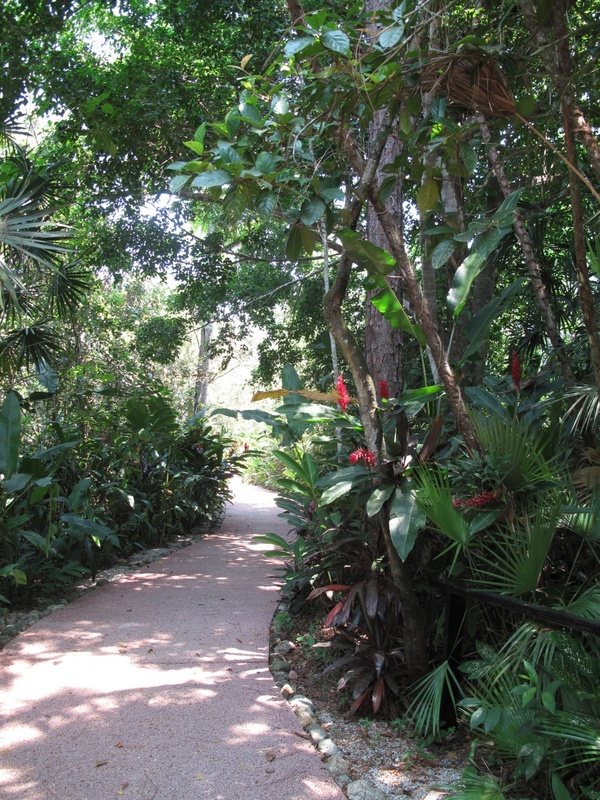 The zoo is beautifully landscaped and you can stay in the shade must of the time. 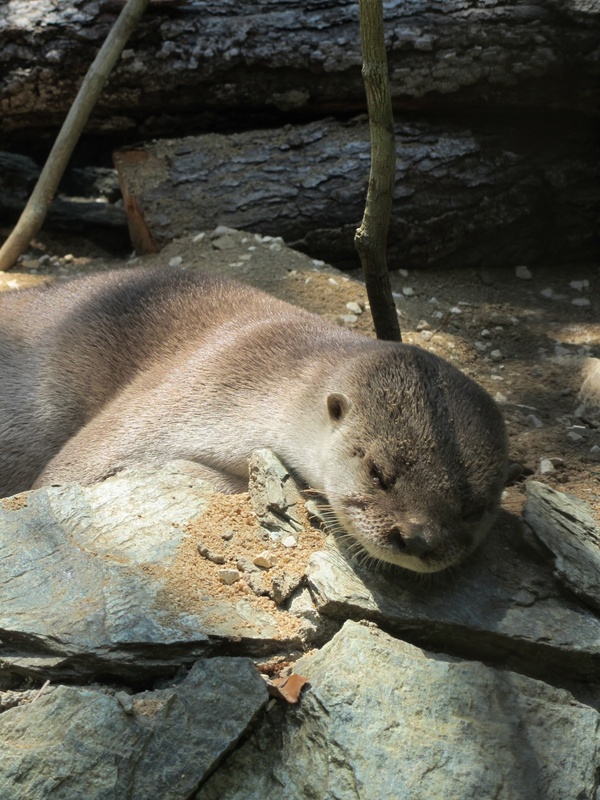 But it was downright sweltering…even the animals were pooped. 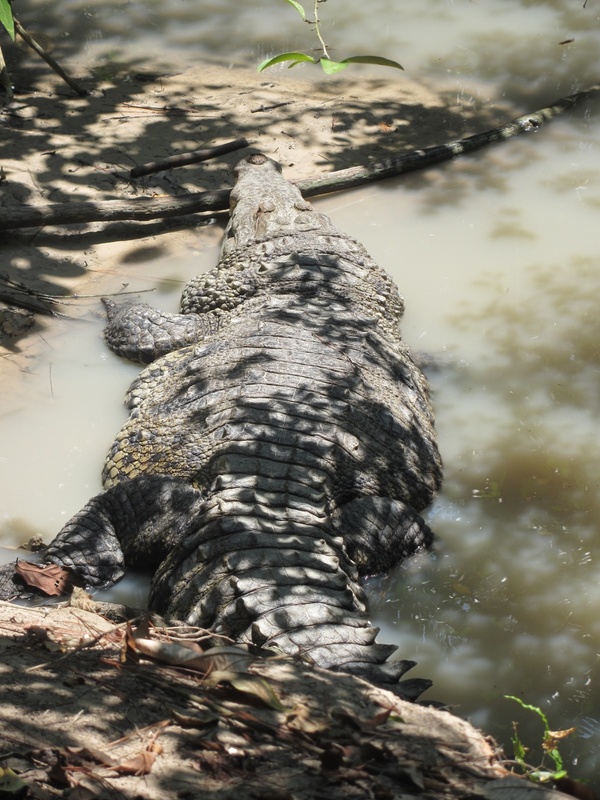 The giant croc was just resting in his mud puddle…. 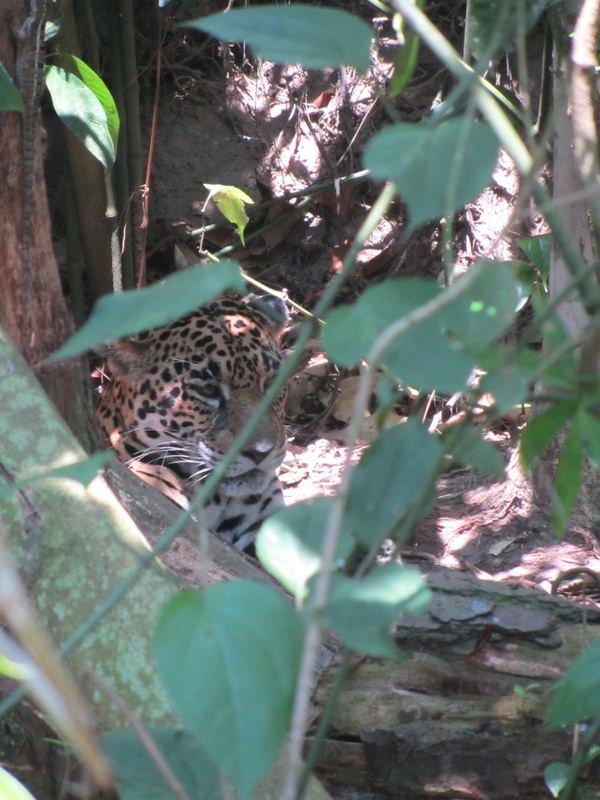 Even my favorite jaguar was nodding off toward the middle of his enclosure yawning. 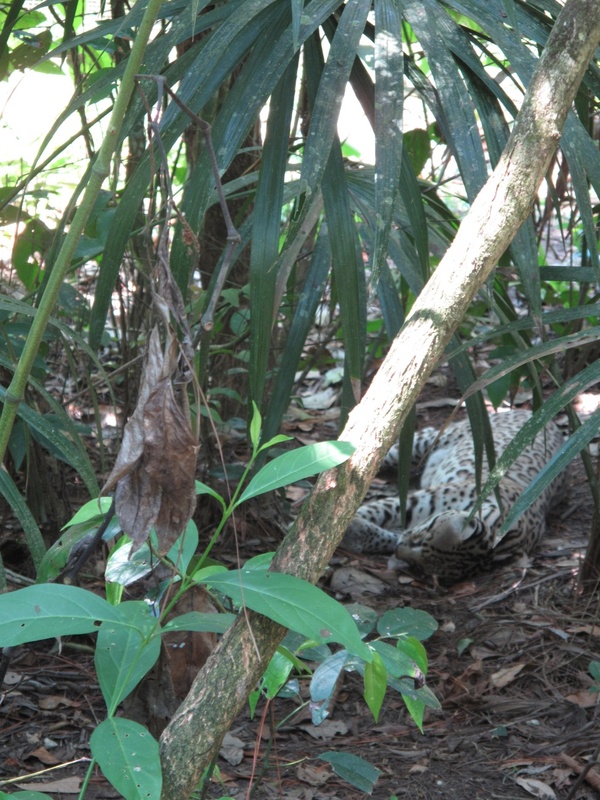 Lucky Boy, the jaguar saved by the zoo in 2012 from near starvation, is doing great. He is HUGE and was napping also. But since he is one of the more rare black jaguars (black ones account for only about 6% of the small population), he was hard to photograph. 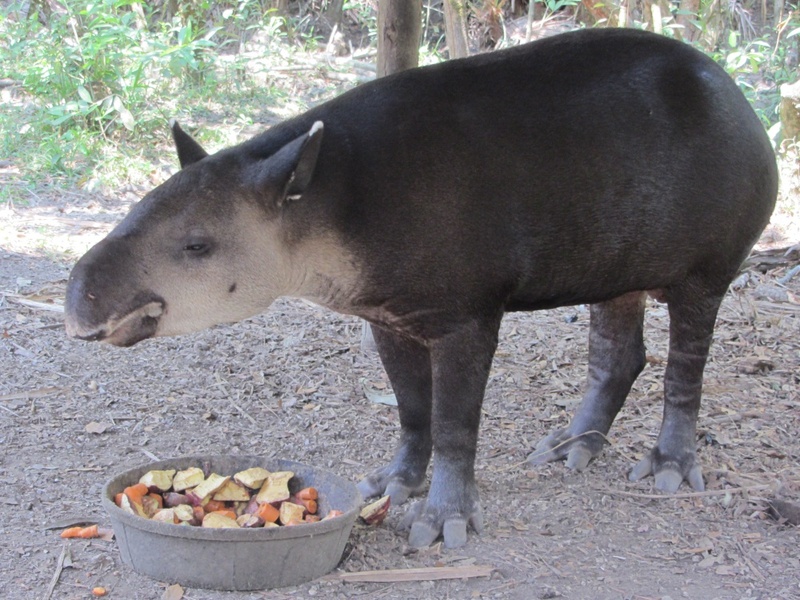 You can read his amazing transformation on the zoo website. The “before” picture will make you ANGRY. Time to head home. 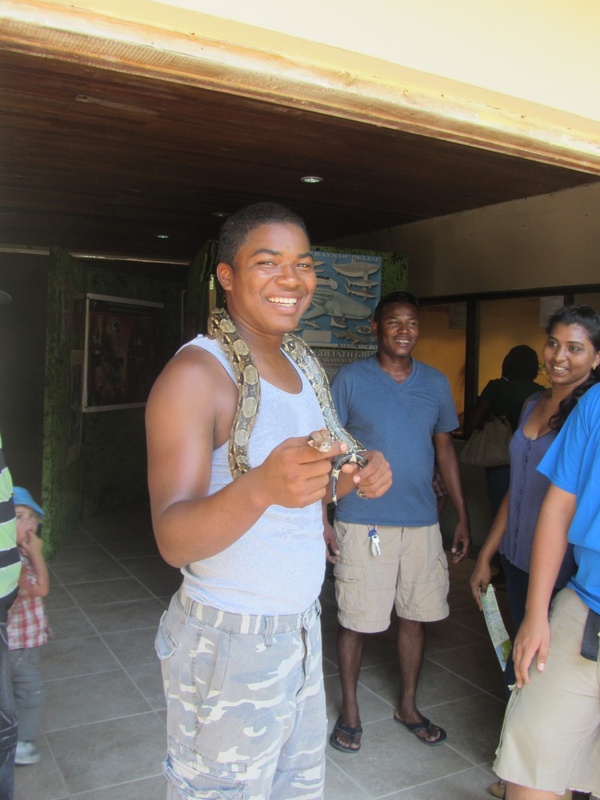 Some kids were holding a boa on my way out. But I passed on the opportunity. I trekked out to the road to wait for the local bus. MAN IT WAS HOT out there. Is my simmering mind playing tricks on me? No…it really is my bus pulling over to save me. THANK YOU JESUS. I boarded, put my bag near the stick shift and settled into the last seat. Plenty of time to make my 3pm water taxi back to San Pedro. 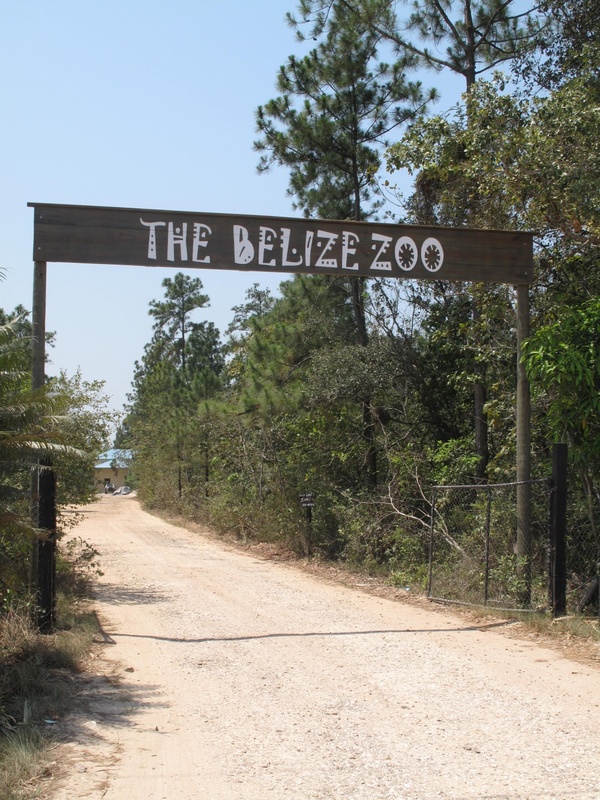 This zoo is a MUST DO on any trip to Belize. LOVE LOVE LOVE IT. Even in this heat. 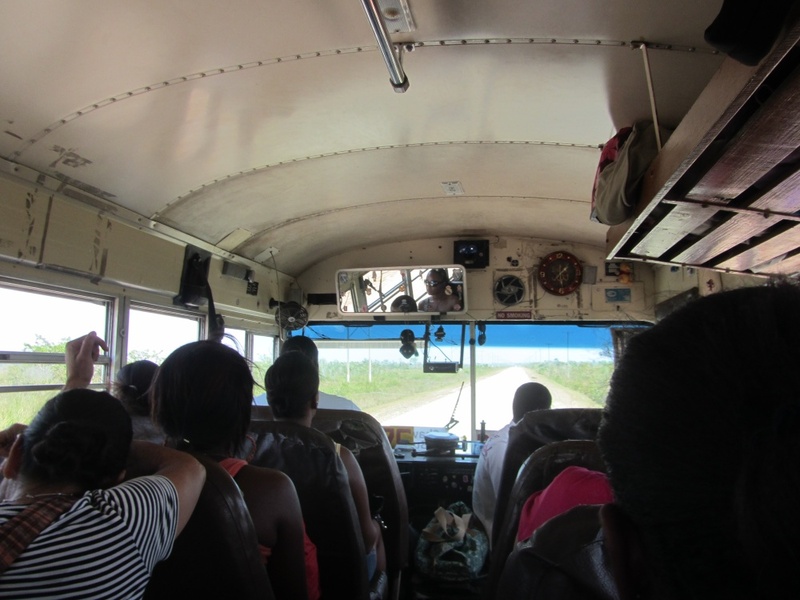 I wanna travel with you…..
All though we bought in San Pedro in 2010, we still have yet to explore the beauty of Belize and all it offers. Your scoop though has made me realize its time to get up and do some exploring. Thanks for your insight.